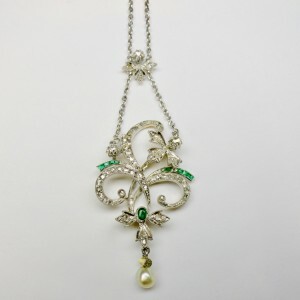 Liberty necklace with beautiful floral design in gold and platinum with diamonds of various cuts, calibrated emeralds and a small pearl pendentif. Measurements: Necklace of 40 cm with pendant 6 cm in total. Necklace in white 18KT gold of geometric design and diamonds of various cuts. 1940's ca. Length of necklace 45 cm. 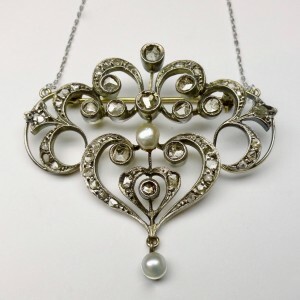 Necklace in gold and platinum with rose cut diamonds, calibrated rubies and cultured pearls. Mobile structure, convertible into a pendant. Deco 1930s.